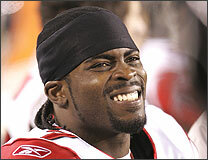 Quarterback Michael Vick won’t be on the practice field when the Falcons have their first practice next Thursday. Instead Vick will be in a federal courtroom to hear charges against him for the alleged dog fighting operation that he and three others were running out of his home in Virgina. 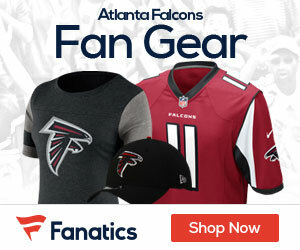 The hearing is the first step in the case against Vick and the others, and while there has been much talk about what the league and the Falcons should do to Vick in response to the charges against him, it looks for now as if both parties will just sit back and wait, and not take any action. The league is not in a position to sit Vick down right now. Despite the charges against him, this is the first time he has been charged in his career, and the league cannot do its own brand of punishment against Vick since they have already said they will only do that with repeat offenders. For now Roger Goodell and the league almost has to let Vick play until something comes down about the case that would give the league enough to make him sit. As for the Falcons, owner Arthur Blank is very image aware, and what is being hurled at Vick is so serious in nature that you would think they would do something against him. For now though, they are also going to take the same approach against one of thier own, and that is to let him play and wait out the charges and soon to be trial. As far as a trial, nothing is even expected to start for at least 4 to 6 months. Vick and three others must be in court next week for bond hearings and arraignments on charges contained in the indictment that was handed up Tuesday. The men are accused of competitive dogfighting, procuring and training pit bulls for fighting, and conducting the enterprise across state lines. As far as the punishment, it could be as heavy as six years in prison, fines of $350,000 and restitution. And forget for now about the Falcons letting Vick go. This season he is on the hook in Atlanta for a salary cap hit of about $6 million, and 15 million in 2008 if they release him. Again, the Falcons and the league are in between a rock and a hard place, and the lingering of all of this is not going to go away anytime soon. Very disappointed that Vick is being allowed to play for now, hope that changes. I have no respect for him whatsoever and hope he gets what he deserves jail time along with his buddies. I also want to add that any team i don’t care who you are should not let Vick step onto a field now or ever, their seems to be plenty of evidence against him and his croonies, how can anyone look up to such a player , too much money certainly created a monster. I will never go to a game again where the falcons are playing, as it seems they could care less, well let me tell you coaches in atlanta this is a very large issue and many of your fans have pets they respect and love and to see what happened on his property is a disgrace, do the right thing coaches and get rid of Vick before he undermines the team more.